Overview : The Retrospective series is comprised of four shoulder bags (5, 10, 20 and 30) and two lens changer bags (2 and 3). Created for the professional photographer that wants to blend in with the crowd and remain inconspicuous in any situation. 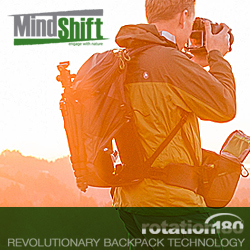 Our product designers have blended the look and feel of "old-school" camera bags and infused it with "new-school" features and technology for the digital imaging age. Inconspicuous, soft-sided shoulder bag with a simple exterior that blends into the environment. Carries 1 pro size DSLR plus 2 - 4 lenses. Quality/Usability : When I was looking for a shoulder bag that would fit my needs, I've read a lot about the Crumpler 7 Million Dollar Home bags. I ended up purchasing on through Amazon. It fit my gear but I felt it was too big to be used a walk around bag. Looking for a bag online is hard considering you can't physically touch it or test out your gear before you purchase. So I ended up doing some research trying to find a better walk around bag but still be small enough to hold my gripped camera with lens and flash. As I've been browsing multiple camera forums and online sites, I've been seeing a lot of photographers talk about the ThinkTank Retrospective whether they are selling their own, looking for one or just talking about it. So I decided to look into it and give it a try. Trying to find a bag that will accommodate a gripped camera can get frustrating. I can't even count the amount of times where I liked the look of a bag but it won't hold a gripped body. If I do find a bag, it's ginormous! Sometimes, the descriptions that manufacturers or online retailers provide can be misleading. The ThinkTank Retrospective 10 looks like a normal shoulder bag and doesn't scream out to would-be thieves, "Expensive camera gear INSIDE". Like all ThinkTank products, the Retrospective 10 is well very made and excellent quality. You will never be disappointed with the craftsmanship put into each ThinkTank product. There isn't much to talk about in regards to the exterior of the bag. It has a cover flap that covers the main compartment, adjustable handle, two side pockets for miscellaneous items and a zippered pocket in the back to hold a notebook/netbook, iPad/Tablet, magazine or papers. When you flip the flap of the cover open, on the underside of the flap cover are two pieces of velcro. You can do one of two things: make it silent or have that velcro tearing noise. For those occasions that require you to be silent like a ninja, simply fold the velcro strip. The velcro is now covered and is known as the "silencer". If you want added protection where you can hear when your camera bag is opened, fold the velcro strap down and use the velcro tab to hold it in place. You can do it for both or for one side. Also on the flap is a spot for you to add your ID or business cards. The front pocket has two velcros on the outside. This is where the velcro on the flap will attach to if you fold the velcro down to allow sound. In the middle is another velcro flap that helps keeps the front pocket closed but there is a velcro pad on the inside of the pocket as well that allows you to not use the flap. This front pocket has folded sides that allow it to lay flat and also expand out if necessary. 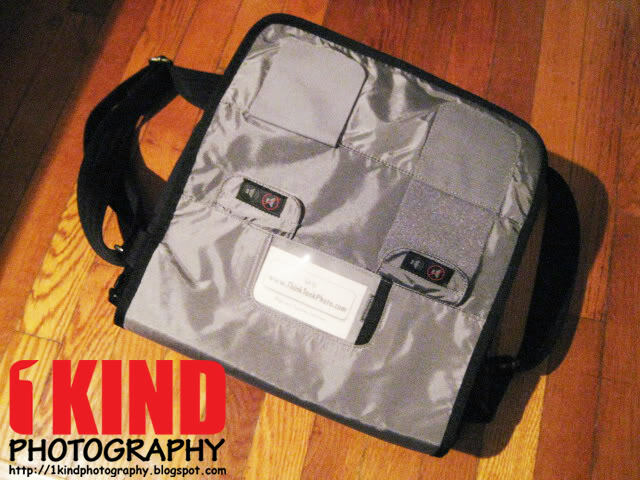 The front pocket is big enough to hold a pro-sized camera body, iPad/tablet or the ThinkTank rain cover, that is included. There are no smaller compartments. The main compartment takes center stage is what we all mainly focus on as this is where our gear will mostly reside. There are two pockets on the outside under the main shoulder strap, but due to the size and tight spot, you can't fit any big items. Inside the main compartment, there are a few pockets for organizing. A pocket on the inside is big enough to hold an iPad/tablet, pens, memory cards and a few small items. There is also a small flap that allows you to attach to to the main compartment to keep the pocket closed. There is also a zippered pocket inside that allows you to store documents or other items that are more important. In addition, there are two small pockets with velcro straps on each side. This is great for holding small lenses and flashes. Like the front pocket and inner pocket, there are velcros inside the pouch that allows you to tuck inside for faster access. At the bottom of the main compartment, I noticed that there are two large velcro paddings to provide extra protection. There are two main dividers that splits the main compartment into three sections. What I like about the dividers is that it has what I consider a "shelf", This gives support in holding up the camera. This also gives a little protection between the camera body and lenses or flash placed inside the bag. Also included are additional dividers if needed. 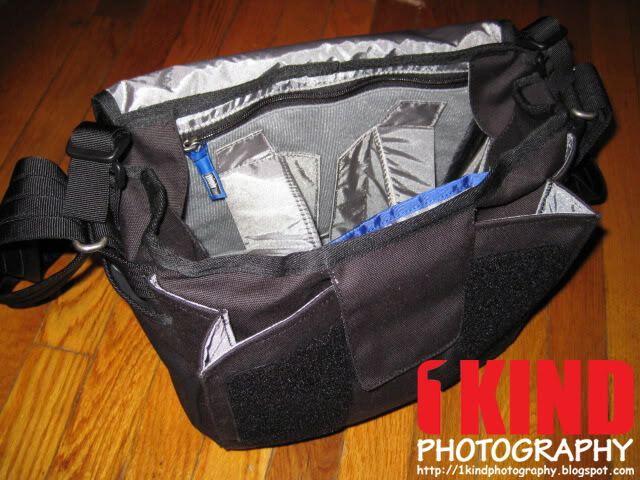 A feature that is often not found in camera shoulder bags are small flaps on the edges of the main compartment. It may not be a big deal to some and it may be a nuisance to some but when a shoulder bag gets loaded and carried by the top handle, the bag tends to sag. This sagging then opens up the sides and essentially lets things into your main compartment area. These little flaps fills the gap and prevents anything from entering the main compartment. The adjustable handle is great for that quick grab and moving it quickly. If you don't want or like the handle, you can remove it but it will require some work. Shoulder straps on shoulder bags, whether its camera bag, laptop bag or just a shoulder bag are your typical nylon webbing straps. But with the Retrospective, the adjustable strap is thicker. I am in love with the shoulder pad. The top of the pad is the same material as the bag but the underside is thick. It provides a lot of cushion and has a few rubber strips to prevent it from sliding off your shoulder. I wish ThinkTank sold the strap separately so that I can replace other shoulder pads. Conclusion : Overall, the ThinkTank Retrospective 10 Shoulder Bag is my favorite shoulder bag. It's a great daily walk-around bag and holds everything that I need. The Retrospective 10 looks like a regular shoulder bag and no one would think its a camera bag. The fact that it is able to hold a gripped camera with a lens attached and flash, it earns brownie points from me. I also like that I am able to carry a tablet with me. If you own more than 1 camera body, you will have no problem carrying additional camera bodies in the front pocket. When you're carrying almost 6+ lbs of gear and carrying your bag all day, you'll want something that is comfortable and the Retrospective's shoulder strap meets that criteria. It's probably the most comfortable strap I've ever used. The bag handles well in light rain but if it starts to downpour, be sure to use the rain cover. Since the exterior side pockets are a tight fit to fit big items, it would be nice to see a soft pouch with a draw string instead. Similar to the pouch found on the Speed Convertibles. This would be great for holding little items for easy access or even a water bottle.